A survey of Sikhs has found that many are undecided over who they are going to vote for in the general election. More than 1,000 people responded to an online questionnaire for the 2015 British Sikh Report. About 40% of respondents said they were not sure which party they are likely to back in the ballot in May. Sikhs, like most ethnic minorities, have tended to vote Labour. But the survey suggests that a growing number are backing the Conservatives. The 2015 report, which focuses on voter intentions in this year's general election, was launched at Westminster on Thursday. It should not be seen as a rigorous poll as the sample wasn't representative. But the people behind it think it gives a flavour of opinion within the Sikh community. The organisers say it is the first time an in-depth report into the voting intentions of British Sikhs has been carried out. Of the people who responded to the survey, 31% said they would vote Labour, 16% Conservative, 4% Green, 3% UKIP and 1% Lib Dem. Report chairman Jasvir Singh said: "It's surprising that 16% of respondents are planning to vote Conservative because it's believed by many that Labour are the party of choice for migrant communities. "It highlights how the Sikh community is changing in the way that it votes and aligns itself with political parties." Web designer Onkar Singh from Derby, is one of those who took part in the survey. His family have voted Labour for as long as he can remember. But this time around he said he intends to vote Conservative. "I feel they have provided the most sound leadership," the 28-year old said. "Since they won the election in the coalition they have improved the economy and employment levels - under a lot of criticism." But 24 year-old Kirith Ahluwalia from Surrey plans to maintain her family's Labour-voting tradition. "I most affiliate with Labour because of their protection of rights of different communities. They advocate a lot of policies for ethnic minority groups and they have always looked out for us," she said. 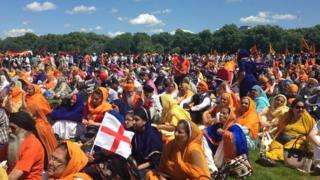 The report is based on an online questionnaire of more than 1,000 British Sikhs. Most of the respondents were aged between 20 and 40 years. Whilst it aims to highlight the changing attitudes and concerns of the British Sikh population, it should not be considered a proper poll because it is not a representative sample of people. However, it is one of the largest annual studies of Sikhs in Britain and is put together by a team of Sikh professionals and academics. One of the questions was about identity. Among those that responded, 65% described themselves as Sikh and British. Conservative MP Priti Patel, who is the prime minister's UK-India Diaspora Champion, welcomed the findings. "It is with a great sense of pride that we can reflect on the fact that the majority of respondents to the survey undertaken identify themselves as being Sikh and as being British as well," she said. The British Sikh Report 2015 also asked whether a row over the Indian Army's attack on the Golden Temple in Amritsar in 1984 would influence their vote. Some Sikhs have been demanding an independent inquiry into Britain's role in Operation Blue Star. Some 42% said no and 31% said yes. One respondent said: "It's important that the Sikh community get the correct answers and reflections into what truly happened in 1984. Without the support and backing of a political party this may be difficult to achieve." People surveyed were also asked about religion and culture. Almost three-quarters of British Sikhs (74%) said they would like to see meat packaging properly-labelled as Halal or Kosher, highlighting concerns in the community over poor awareness of Sikh issues. For Kirith Ahluwalia, many of the areas explored in the British Sikh Report are distinct from British Asian issues and need to be understood by decision makers. "I know a lot of people who don't know what Sikhs are and a lot more who don't know that Sikhs don't eat Halal meat… so I think these are all things that need to be addressed."